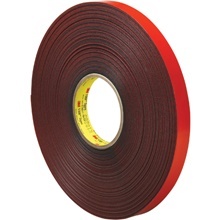 Double-sided tape comes in handy for many uses including mounting, sealing and installing. It's often undetectable as it sits between two layers, holding them together temporarily or permanently, depending on the style of tape. Most brands of double-sided tape come with a liner, exposing only one side of the adhesive. The user applies it to the surface and then lifts the liner exposing the second layer of adhesive. Some come with a dispenser for easy application that you can refill with another roll when the current one runs out. When picking a tape be sure to consider the environment where it's going. Some kinds are water resistant while others need protection from the elements. Standard double-sided film tape works well in most general purpose situations. Foam tape is great for hanging pictures, canvases and wall are that have a flat back the adhesive can stick to. Then there's 3M VHB™ tape. It's VHB sands for "Very High Bond." It's used in extremely demanding conditions because when it sticks, it's really hard remove. Automobile manufacturers use VHB™ tape to adhere things like moldings to their cars.